Bright, sparkling peridot and glowing sunstone ovals vie with each other for the viewer's attention in this eye-catching fringe bracelet. The oval stones have been swagged and finged onto a sturdy sterling silver chain with swathes of seed beads in colours that match those of the stone beads. The 7-1/2" bracelet closes with a sterling silver lobsterclaw. You'll be hard-pressed to suffer from the blues when you wear this green and gold (U of Oregon ladies, please note) beauty. All of our one of a kind and limited edition artisan beaded jewelry is individually handcrafted in our studio in Los Angeles, California. Be sure to browse our online store to see all of our bracelets, necklaces and earrings and other fashion accessories. When summer sizzles, you're going to want earrings that sizzle right back. These babies do the trick. 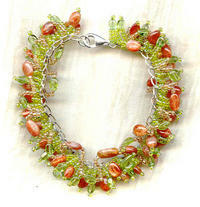 The 3mm round beads that form the basis of the ring are peridot gemstone which I've woven together.